As part of a substantial revamp and expansion of the new Kia car range, an evolution of the Sportage joins the line-up. This becomes the fourth generation of the model, displaying a completely new body style. The outgoing third-generation Sportage was one of Kia's most successful vehicles. It launched in 2010, almost immediately becoming a flagship model within the range. In previous incarnations, the crossover has won two Red Dot awards for design and was a repeated CarBuyer Awards’ Car of the Year. J.D. Power's driver survey results for 2012 revealed that the compact SUV was one of the highest scorers for customer satisfaction. The Sportage remains popular pre-owned, having also been named Used Car of the Year in 2014. Kia selected the 2015 Frankfurt Motor Show as the venue for the updated model's European debut. On the new Sportage, sportier elements combine with the adjusted stance to create a stronger athletic feel. The design is based on the Kia KX-3 concept presented in China during 2014. It looks slimmer, styled with arching roof rails and smooth door panels. The typical sculpting seen on many crossover models has been replaced with careful streamlining – and this positively impacts how quick and efficient the Sportage can be. Kia's recognisable 1, 2, 3, 4, GT-Line and First Edition equipment levels remain available. The KX-1, KX-2, KX-3 and KX-4 models are all four-wheel drive versions. GT-Line is new to the crossover, a sign of the manufacturer's recent emphasis on high-performance engineering. The additional design features for the trim level include 19-inch alloys, body mouldings in satin chrome, twin exhaust pipes and gloss black accents. From 3 upwards, the front and outer rear seats in the Sportage are heated for added comfort. Armrests are standard supports for all passengers, with many models featuring a soft leather finish. The First Edition is one that Kia fans will want to experience. It showcases exclusive, forward-thinking technologies. Wireless device charging can be activated by placing a smartphone onto the centre console. In all models, music players link to the sound system via USB and AUX ports. The car has at least six speakers, with higher trim levels increasing that number to eight. More engine and gearbox options are available with the fourth-generation Sportage than ever before. Customers still have the choice between petrol and diesel power. A 1.6-litre turbocharged petrol is expected to be popular, as it generates 174bhp and partners either a six-speed manual or seven-speed automatic transmission. The 1.7-litre diesel engine drivers can also choose should become an instant favourite for economy and efficiency. 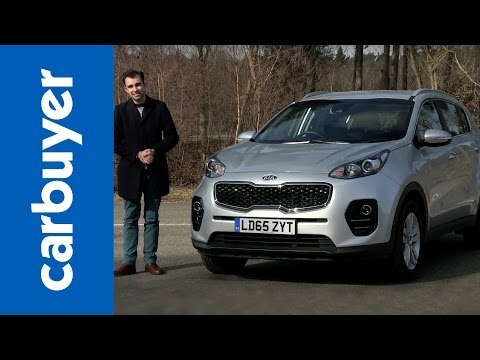 It enables the Sportage to reach as much as 61.4mpg combined. Other 2.0-litre diesels are offered, at up to 182bhp and 400Nm of torque. In any configuration, the crossover is just as safe. It has held onto a five-star Euro NCAP rating awarded in 2010. The surrounding twin airbags include a roll-over sensor, which will activate the curtain airbags automatically. Braking, traction and stability controls similarly keep the Sportage stable and support drivers, with Trailer Stability Assist a particular benefit when transporting large items. The 4, KX-4 and First Edition models now provide the added reassurance of Blind Spot Detection with Rear-Cross Traffic Alert and Autonomous Emergency Braking. Advanced Kia technology in the Sportage is always on guard. The latest Kia Sportage has been on sale in the UK since February 2016. Test drive the Sportage and find out more – visit Birchwood Kia in Eastbourne or Washington where you can also view our extensive range of quality approved used Kia Sportage for sale. Please get in touch today to speak with one of our Kia experts.